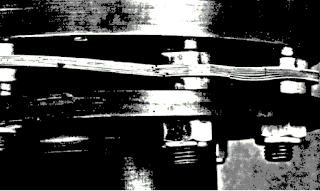 If history is any judge, this post will be by far the most popular in our mini-series of three blogs on disc couplings. 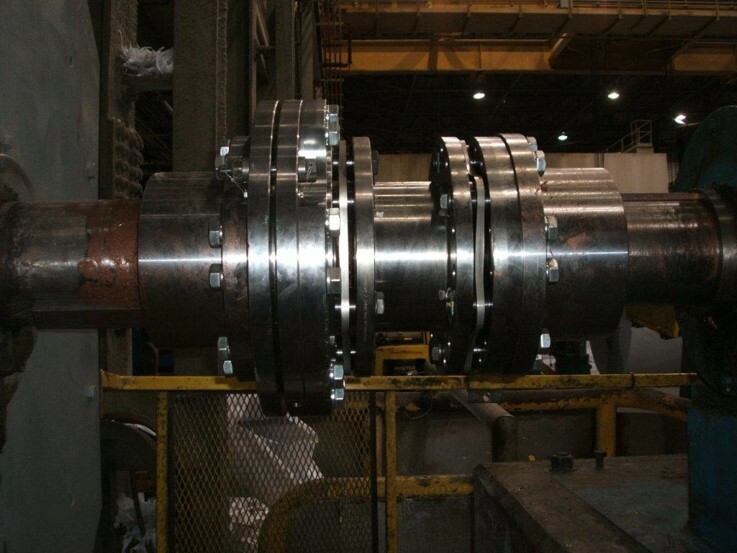 The first post provided a broad overview of disc couplings, and the second posts covered a number of key terms used when talking about disc couplings... but this third post is on the riveting topic of disc coupling failures. 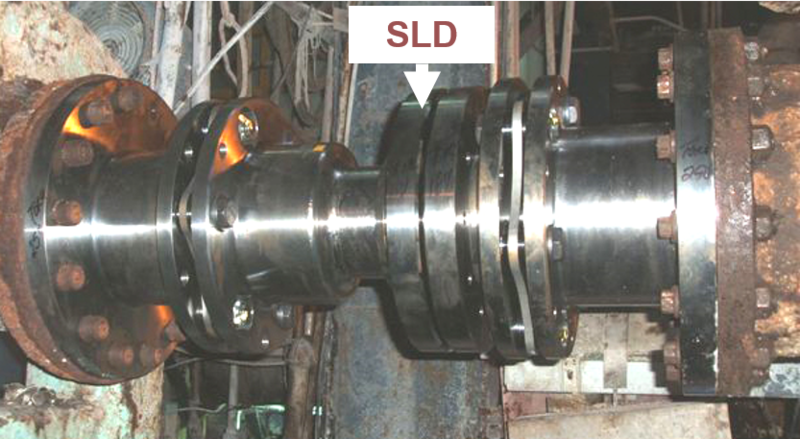 Like many other coupling types, disc couplings often fail in with telling or "signature" ways that point to a likely culprit. 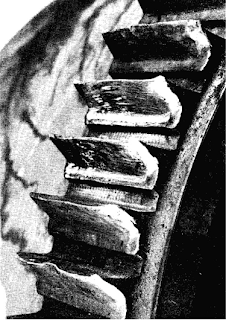 As pictured at right, when a disc coupling is subject to excessive misalignment it is likely to experience disc pack cracking near the bushings, with the outer layers fracturing first. Note: Given disc packs generally crack from the outer layers in, it is certainly possible that a coupling will continue to transmit torque/function with cracks in the outside layers. This means that it is still important to inspect the disc pack on a periodic basis even if the coupling appears to be functioning properly. Fortunately disc packs can generally be inspected without disassembling the coupling, and possibly even when the coupling is running (by using a strobe light assuming the coupling guard is not solid steel). If misalignment is the likely source of a disc pack failure, it is important to realign the coupling prior to restarting the system, less the issue repeat itself. (Two options to consider when realigning a coupling are laser alignment and dial indicators.) An additional step you can take if you are not using a scalloped disc pack by Lovejoy (which offers increased misalignment handling over legacy designs), you can source a replacement coupling from us! 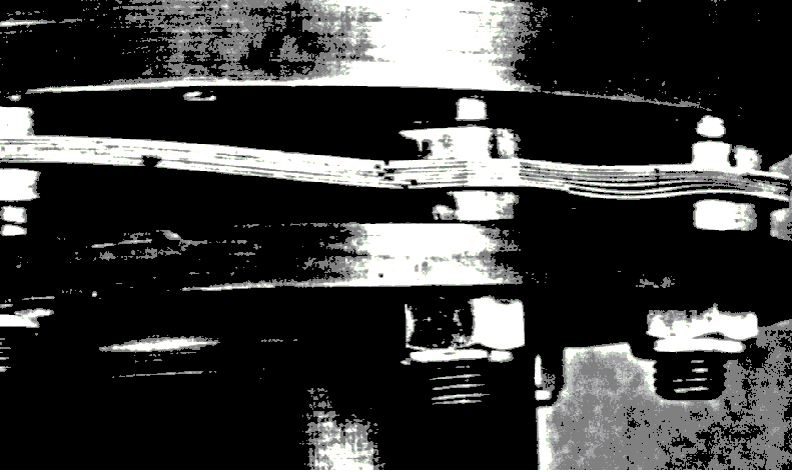 Torque overload failures in disc packs look different from misalignment failures in that the fatigue cracks tend to form in the center of the disc pack rather than up against the bushings (as pictured at right). A second thing to look for when suspecting torque overload on this disc pack is any evidence that the disc pack layers (or laminates) are separating or ballooning away from each other in the center sections between bushings. 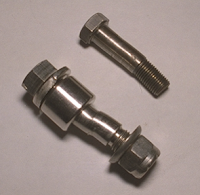 In addition to the disc packs themselves, the bolts used to connect the disc pack to the flanges may be bent or distorted. Such distortions are another excellent indication that the coupling is seeing torque in excess of what it was designed to handle. A third and final common way that torque overload reveals itself in a disc coupling is if a coupling hub actually bursts over the corner of the keyway. 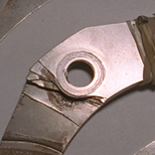 This is a failure mode common across many coupling types, and the reason the coupling fails at this point is because, due to the cut keyway, this is the weakest point in the hub. One of the fastest way to damage a disc coupling during installation is to use impact wrenches. (Do not do this!) Not only does using an impact wrench raise the potential of twisting the disc pack (pictured at right) in a destructive manner, but it also raises the possibility of friction welding the fastener bolts to either the disc pack and or the connected flange. 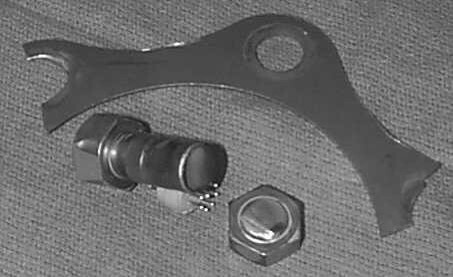 Fasteners should be lubricated prior to installation and torqued with care. 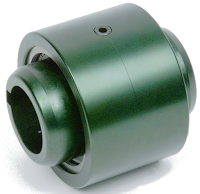 Having just covered misalignment, torque overload, installation, fastener, and environmental failures of disc couplings, a natural question might be "How long is my coupling going to last?" 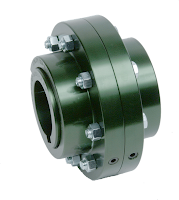 Unfortunately, like all other coupling type, disc coupling life is not generically predictable as it is highly dependent upon the application and the misalignment of the given system it is driving. Shaft alignment does correlate strongly with longer coupling life... so taking the time to align the system properly with periodic checks should pay lasting dividends and not be overlooked. To learn more about Lovejoy's disc coupling solutions for your applications, please check out Lovejoy's disc coupling product pages & catalogs, the non-lubricated section of The Coupling Handbook, and/or pick up the phone ask to speak with a Lovejoy application specialist. The diagram of an industrial DI Type "drop-out" style disc coupling at right highlights a number of useful terms common in describing a disc couplings. 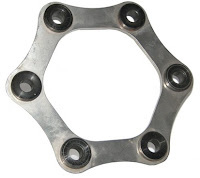 "Hubs" are the metal element designed to attach to the two shafts of a power transmission system. 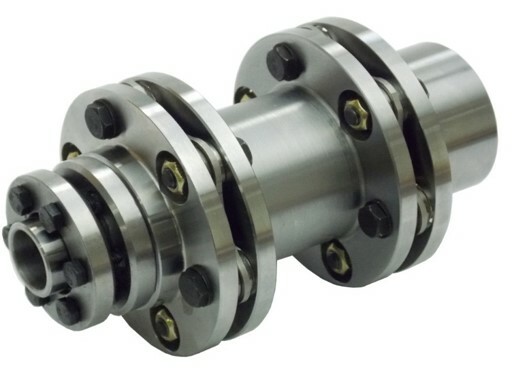 "BSE" stands for "Between Shaft Ends" and describes the specified distance between to two shafts that the coupling is design to connect. "PW" describes the space allocated for the each disc pack. 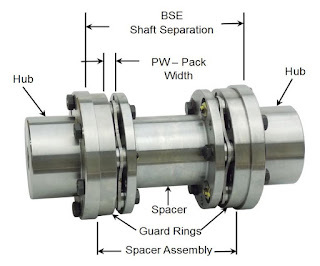 The "Spacer Assembly" is called out specifically in this design as the whole center section of the coupling, including the two disc packs, is designed to be able to be removed from an installation with requiring the coupling hubs to be moved or removed. 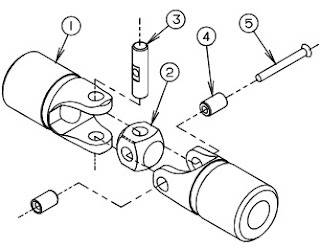 A drop-out spacer assembly section, as shown in the image above, is an additional feature not common to all spacer disc couplings. 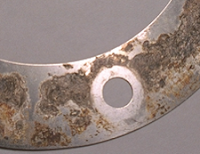 An example of a spacer disc coupling without a drop-out assembly section would be Lovejoy's SX Type. 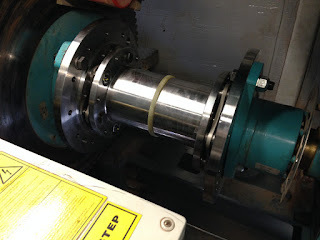 In the case of Lovejoy's DI Type disc coupling, "Guard Rings" are included and hubs are piloted to ensure proper centering of the drop in spacer assembly. This piloting serves as an anti-flail feature and aids in the couplings ability to meet API 610 requirements. While disc couplings commonly use interference fit hub-to-shaft connections, another hub-to-shaft connection feature available for disc couplings are shaft locking devices ("SLDs"). 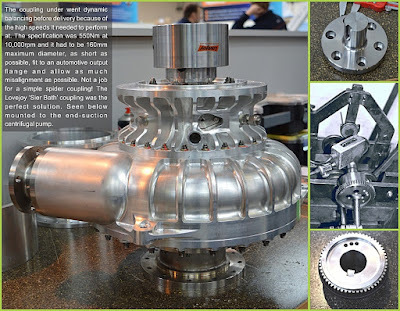 As shown in the photograph at right and the installed photograph below, shaft locking devices allow pressure to be exerted on a hub to connect the hub firmly to a shaft for torque transmission. The advantage of using shaft locking devices is that users can avoid interference fits that require significant maintenance time to remove. 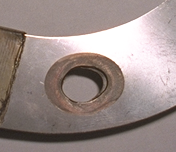 The disadvantage of shaft locking devices is the initial upfront cost. Additionally, watching tolerances and understanding the ratings of a shaft locking device are also critical as the shaft locking device may have ratings below the coupling and or system requirements. To learn more about disc couplings, please check out Part 1 of this blog series... or Lovejoy's disc coupling product pages & catalogs, the non-lubricated section of The Coupling Handbook, and/or subscribe to this blog as there will be several more blog posts on disc couplings in the immediate future. 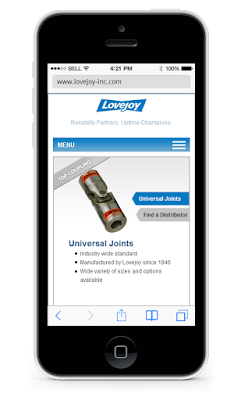 It may have taken us a bit longer that we had hoped, but we are still very excited to share that our Lovejoy website (www.lovejoy-inc.com) is now "mobile friendly" for all our smart phone users out there! Unlike this blog, which was started long after "mobile friendly" became a hot topic... and was "mobile friendly" since inception, the Lovejoy website was built on a platform long before mobile friendly was of primary concern). As such, recoding the site to be "mobile friendly" was both labor and cost intensive... but we recognized the value being mobile friendly was for our dedicated users base (especially those out in the field looking to access a key dimension or installation guideline) and committed the necessary resources. 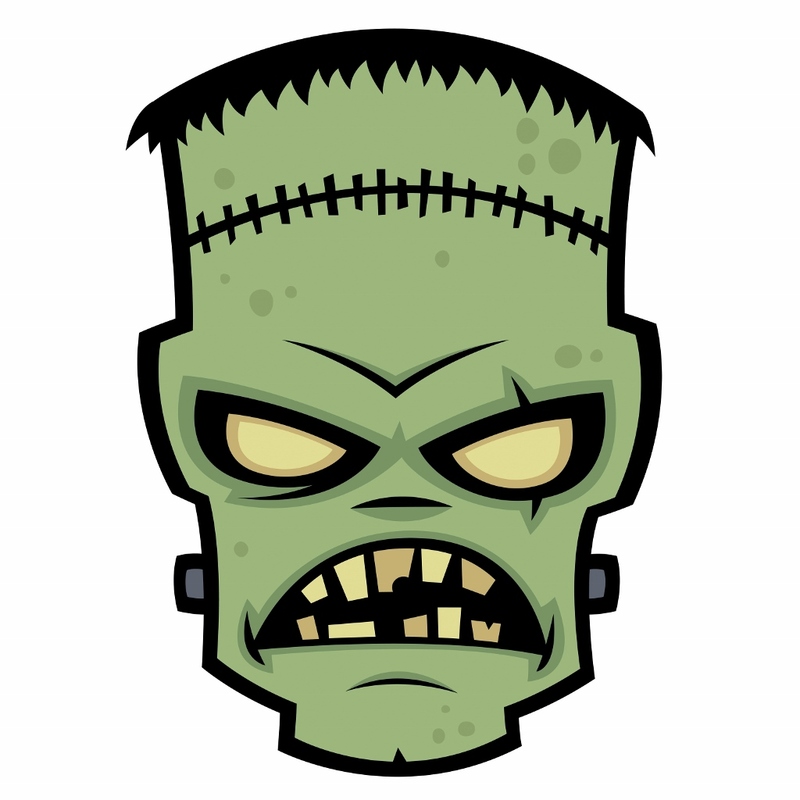 With Halloween just over the horizon, we thought it would be worthwhile do write a blog post on something Lovejoy is particularly well renowned for: Frankenstein couplings! 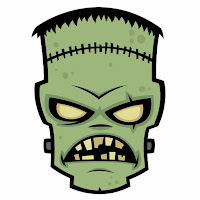 What exactly is a Frankenstein coupling? It's a one-off, highly customized or unique coupling that most coupling manufacturers run away from. 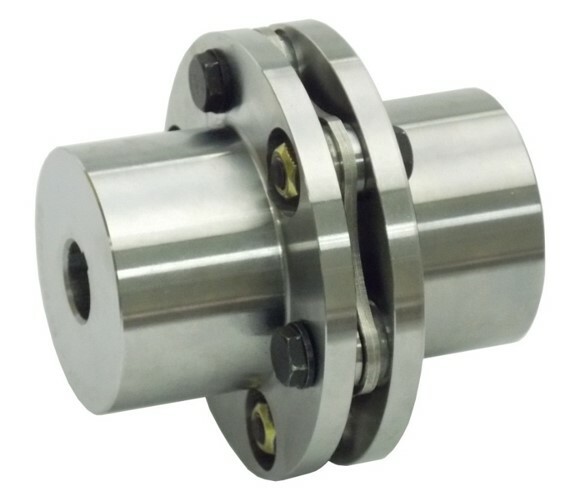 Fortunately, given Lovejoy's tremendous depth of product knowledge, experience, and local manufacturing capabilities... such couplings are standard practice for us, and these are opportunities that we readily welcome. In fact, our reputation is such that, while they might not like to openly admit it... other well-respected marketplace players have been known to send such business our way. From the most exotic materials (Inconel, Specialty Stainless Steels, Composites, etc.) & head-scratching unique configurations...to our tremendously deep lineup of "standard" off-the-shelf solutions, Lovejoy's team of Application Engineers and Specialist are on standby to help you and your organization succeed. 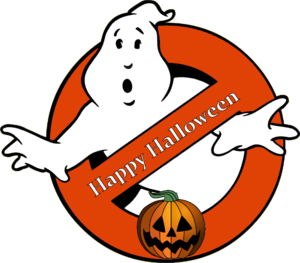 We look forward to being a growing resource for you, and wish you nothing short of the happiest Halloween ever! What is the difference between a spacer vs non-spacer coupling? Flexible couplings can serve a multitude of purposes in a power transmission system, but the two most primary are connecting two shafts (so that torque can be transmitted)and accommodating misalignment between these two shafts (to allow the system to operate more optimally and extending system life). 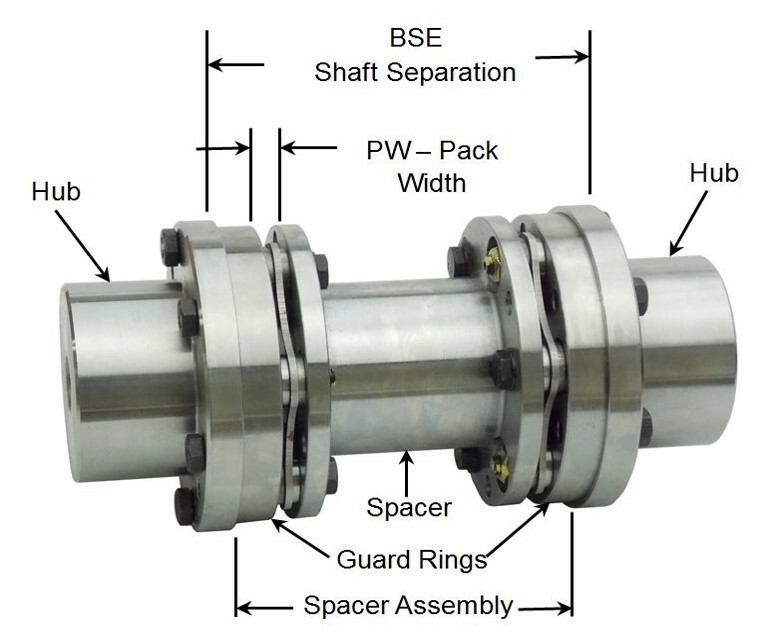 To increase the flexibility of a coupling to handle larger BSE situations, spacers can be added to a coupling design. 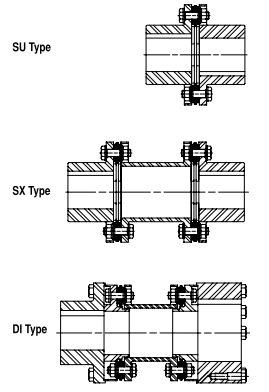 Furthermore, by leveraging a spacer design with flexing elements on each side of the spacer, a coupling can generally be expected to be able to handle more misalignment as that spacer component grows longer. As a third benefit, spacer designs can also be designed to be "drop-out" making for easier system maintenance and repair. 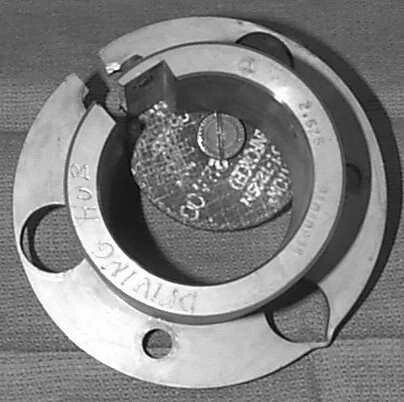 Pictured at right are three diagrams of disc couplings found in Lovejoy's disc coupling product offering. The first, the SU Type, leverages a single disc pack and two hubs. There is a single flexing element, and the "BSE" range is fairly limited. The second, the SX Type, incorporates two flexing elements and a center spacer element. This spacer element can be extended or shortened based off of a users unique "BSE", while the hubs and disc packs can remain common to the SU Type design. 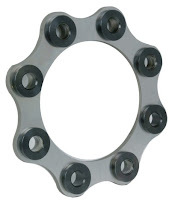 The third coupling shown, the DI Type, allows for the entire disc pack spacer assembly (comprised of the spacer, 2 disc packs, and 2 guard rings) to be removed from a system without being required to remove the hubs or push back any other pieced of equipment. 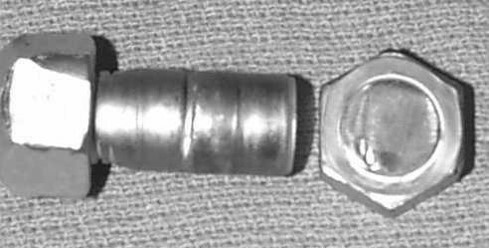 Whether a coupling is a "spacer" or "non-spacer" design does not describe the type of flexing element being incorporated into the design. 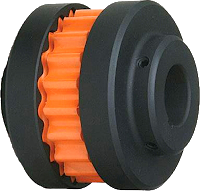 Elastomeric couplings (such as Lovejoy's L-line or S-Flex) and metallic couplings (such as gear, grid, and disc - shown above) are all offered as core "non-spacer" designs, but are also available in standard and custom spacer varieties. While there are many benefits to spacer designs, they also do have several important detractors. First, you are adding material and complexity, so the cost of the coupling will generally be higher as the "BSE" requirement grows. Also, as the "BSE" requirement grows and material is added, weight is also generally added to a system. This overhung load can lead to increased load on the systems being coupled (potentially generating excessive loads on bearings, etc.). Where spacers become long and weight becomes an issue (i.e. - cooling towers), spacers traditionally made out of hollowed out steel can be replaced with carbon fiber or composite tube spacers, though this change will add further cost to the overall coupling solution. Chains and belts are both naturally prone to stretching, and… if proper tensioning is not maintained in a system… a number of issue may present themselves, inclusive of suboptimal operation, premature system wear, and, ultimately, system failure. Designed specifically to provide economical, maintenance-free, continuous tensioning for belt and chain drive systems... for almost any application... Lovejoy’s full line of RunRight® tensioners are up to the challenge. Tensioners are available from stock in seven sizes (SE11, SE15, SE18, SE27, SE38, SE45, & SE50) and a number of mounting configurations (standard, front mount, double arm, dual arm, stainless steel, plastic...) to handle a wide range of load demands and environmental conditions. 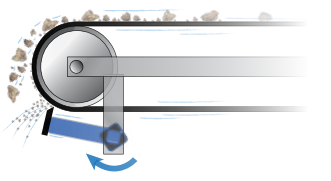 Most tensioners are also equipped with a two mounting holes: a "normal" and "hard" position to offer further system optimization. In depth product catalogs are available on Lovejoy's website. Should you have any further questions or concerns regarding this product line, please do not hesitate to contact a Lovejoy application specialist.